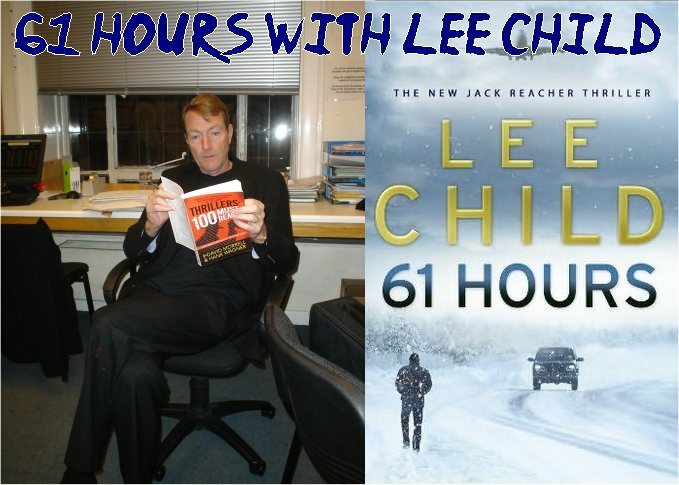 o another year and another Lee Child novel, except in 2010 we get two Jack Reacher novels; the first, 61 Hours, has gone on sale in the UK and into the British charts with a bullet, with the US release following shortly and inevitably a listing in the NY Times. Its sequel is to follow in September. I have followed Lee Child’s work for many years now and traditionally we meet up at Waterstones Deansgate bookstore in Manchester where he starts his annual UK book tour. Over dinner we catch up on each other’s lives, and I learn a little more about his craft and what to expect in his latest Jack Reacher thriller. Lee Child is one of the best ambassadors for the crime/thriller genre as he never forgets his oldest fans and those who supported him when he changed career from TV production to writing fiction. Shots Magazine [when it was a print edition] was the first publication to review his debut Killing Floor. This year we were unable to dine after the event, as both our lives have become rather hectic. Lee had to head off to London that night following the talk at Deansgate, while I had to head off to Brighton for the World Horror Convention 2010; a special occasion as it was the very first time the convention was being held in Great Britain. However, thanks to Nick Lewis at Waterstones, we had a coffee and chat before the event and with my trusty tape recorder I managed to get some insights into the world of Lee Child, including why winter weather features in the plot of his latest novel, his view on book piracy, and why there is no sibling rivalry between himself and Andrew Grant. Ali : What came first when you embarked upon writing 61 Hours – was it a large plot that required two novels, or was it pressures from your publishers or purely an idea that came into your mind? Lee : You mean about the end of 61 Hours? I see the end of 61 Hours a little differently from many who have read it. It’s about something I have been trying to develop over the last few books – basically to trust the reader a little bit more, in as much as in previous books I’d lay out the problem and then provide the solution. In 61 Hours, what I’ve done is lay out the problem, but trust the reader to uncover the solution. There is no mystery to the solution, or the ending. Everything is there, the closure, the evidence is there, anyone can work out what must have happened, and it’s up to the reader to work it out. It’s all completely transparent. Even so, we’re going to have to wait for the next book this year. And have we got a working title yet? Not yet, it’s something that we’re working on currently, and we hope to have it soon. Location is always important to you in the Jack Reacher series, so why South Dakota? Well it’s not so much about South Dakota, but more about temperature. I was thinking about one of my earlier books – Echo Burning, set in West Texas, where it was incredibly hot. The heat becomes essentially a character in that book, and I thought I’d like to do a book where unbelievably cold weather becomes the same type of character. Writing about the cold is something I’ve wanted to do for many years, but I’ve always been a little inhibited by Alistair MacLean, a big hero of mine and a thriller writer who was pre-eminent at writing about cold weather. Novels such as Night Without End and Ice Station Zebra are set up above the Artic circle where the cold weather is a real factor and he did it so well. I often wondered if I could write a novel set against the cold. I decided eventually to give it a go, setting a book against an icy backdrop – hence 61 Hours is set in a cold winter in South Dakota. You also have a piece in another book coming this summer – ITW’s Thrillers: 100 Must-Reads edited by David Morrell and Hank Wagner – so could you tell us a little about it? Sure, the project stemmed from a question ITW is interested in answering – ‘What is a thriller’? It is a very difficult question to answer, so one way is to lay out 100 books and say, ‘This is what a thriller is’, using great thriller novels to define the genre. My contribution went way, way back as there is always a secondary question: ‘What was the first thriller or the earliest thriller?’ Many people sometimes look back a hundred years to what was then referred to as a novel of sensation; or perhaps Wilkie Collins, John Buchan, or Erskine Childers. But in my opinion, you need to look much further back, and yes, there will be work[s] lost in pre-history. But for my money the first thriller that we know about was ‘Theseus and the Minotaur’ which is 3,500 years old and in fact is an identical story to Ian Fleming’s Dr No, so therefore the prototype of the thriller novel. Yes indeed, I went to the same high school as Ambler, not, of course, in the same year ­– he was a little older than me [laughing]. While doing a little research earlier I was alarmed to see 61 Hours available as an e-book on a Bit-Torrent website for illegal download. What is your view on the piracy of books via the internet as well as the issues of e-books and digital rights management? Well we have two major problems, firstly we have this irrational expectation from the customer about price. There seems to be this bizarre logic that because an item is delivered electronically, it should be free. Electronic delivery eliminates the physical book that needs to be manufactured, stored, delivered, stocked, etc, and that cost within the manufacture and supply chain comes with a cost. ( So if you take as an ‘over the thumb’ average cost of an average book (ignore heavily discounted bestsellers who have volume or short-print run specialist books), say that manufacture and supply chain cost is £4 [$7] per book, then the rest is £10 [$18] that makes the book on a shelf cost of £14 [$25]. So if you had an electronic book, and you strip out the manufacture and supply chain cost, the item would cost say £10 [$18]. Some of the public however feel that an electronic book should be priced at £0.99 [$1.85], which is crazy logic. Problem two is that digital distribution is not as cheap as people think it is, because the service costs are high as well as the piracy protection which is very expensive and complex. We are suffering piracy in the same way that physical bookstores suffer shoplifting. There will always be a proportion of books suffering ‘shrinkage’, as they refer to it in the retail world. Authors like me, and my peers and contemporaries are getting their books pirated several hundred times a week. Therefore this problem needs to be addressed by some form of digital rights management which is very expensive to do. So this whole idea that digital distribution is cost-free is totally wrong – in fact delusional. The Rap Sheet reported that you made an interesting appearance at this year’s Left Coast Crime; care to tell us about it? I remember nothing about that interview … [laughing] … it was done by Gregg Hurwitz so it was completely off the wall. Seriously, it was a great convention, and as the title LCC suggests, it was on the far left coast of America and therefore tends to be a smaller convention, more relaxed, more chilled and I had a tremendous time. And a book landing shortly is Die Twice by Andrew Grant; can you tell us a little bit about that? Yes, it is by my younger brother, his second book that I read a little while ago and I was impressed. In fact, that reminds me of a question Gregg asked me at LCC 2010: ‘How’d I feel if Die Twice was the next Da Vinci Code?’ I would feel great; there is no sibling rivalry between Andrew and me, due to the age difference. I had left home around the time he was out of his crib. In fact he’s closer in age terms to my daughter than me. You’ve got kids, Ali, so how would you feel if any of your kids were amazingly successful? Exactly! And that’s how I feel about Andrew – if he becomes the next Dan Brown I’d feel terrific. Andrew’s writing style is very different to yours and he tends to focus on the espionage angle, but he’s a fine thriller writer – is that anything to do with shared reading tastes? Yes, I think you’re right, he read similar books to me, but where we diverge is that he’s had much more exposure to the corporate world, in the nooks and crannies where you see some dodgy dealings and government interventions, and he knows that stuff for real. Interview him some time, and ask him about the job he was offered straight out of university. I don’t have that government background or insight so my work is very different. And does that put pressure on your other brother? I actually have two other brothers, but they’re illiterate so there’s no worry there! SHOTS would like to thank Nick Lewis, the events coordinator at Waterstones Deansgate for the use of his office to record this interview, and Patsy Irwin of Transworld for organizing this interview. An edited version first appeared at THE RAP SHEET. Click Here to view the special Lee Child party that Shots attended celebrating a decade of Jack Reacher.